For the past few posts, we’ve been talking about what it takes to have a digital presence. After all, in the old days, your business location and a good yellow pages ad might have been all you needed. But who can find a yellow pages directory anymore? And if you’re under the age of 35, do you know how to use one? Let’s face it most of us just type into Google the category of a business or if we know the name of the business we’re looking for, we type their name in and expect them to show up with their address and phone number. We push one button and the phone dials for us. Easy Peesy. Technology is great when it works as we expect. Now the big question is how do you make sure that you show up in a search and better yet ahead of your competitors? To see what it takes to have a complete digital presence here is a link to an earlier post in case you missed it. In this post, I want to help you multiply the number of times you show up in a search. This can be on Google or one of the other search engines, though Google has most of the search traffic. After all, having your website show up on the first page of an online search is great. But if your competitor is just above or below you and there are 9 others to chose from you’re going to miss out on calls. You can have 2 or 3 or 4 or more of those 10 options all leading to you? How do you do that and not spend 1000s every month? You set up social media pages on different platforms . . . I listed Facebook first here for a reason. Besides the fact that is the largest social media platform, many times your page gets reviews. And Google loves seeing consumer ratings on your page, so a Facebook page with reviews will come up high in a search. At times your Facebook page may be above your website in a search. And then there are all the other platforms you can be on. It’s not uncommon for our clients to have 4 or more listings on the first page of a search. One note, if you sell to other businesses, LinkedIn is going to be your second-best option on a search. As long as your Facebook page has a steady flow of reviews, it’s going to come up ahead of your LinkedIn page. Youtube is always good if you have videos to add. After all, Google owns Youtube so they index and show videos high in searches too. I always recommend to my clients that they use any material they create on multiple platforms. If you make a video post it on Youtube and Facebook or if you’ve created a great blog post, make sure it’s on Pinterest, with a great picture, and Facebook, and your website. Most of these platforms have different audiences and few people will be following you closely on every platform. A big part of making this work is having an active presence on the social media sites you chose to use. Just creating a Facebook page and having less than 100 likes and no reviews will not get you listed as well as if you have an active page with a steady flow of reviews. With a little effort and a solid strategy, you can dominate the first page of search with your website, your Google My Business page, and your social media pages. P.S. 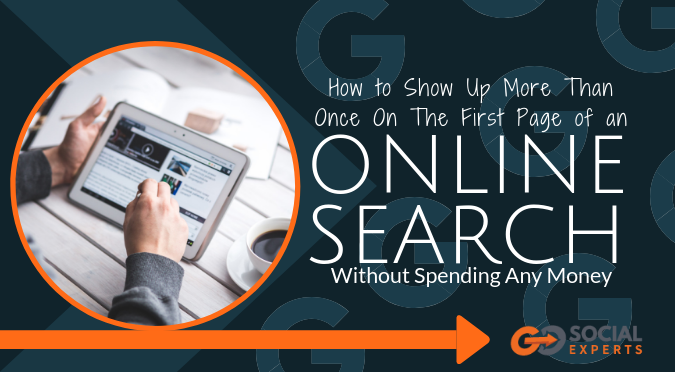 To see how you show up on an Online search, open an incognito window in your browser and type in the category your customers would search for when looking for your business and see what show ups. Next in an incognito window again, type in your business name. Where do you show up and is the information accurate? Then use our scan tool to check your listing on multiple platforms. Click Here to see how you show up.